National Honey Show rules and regulations 2018. Also see Guidance for Exhibitors and Competitive Classes. All products of the hive must be the bona fide produce of the exhibitor except where stated. 1. ▲All entries must be made on the form provided or Downloaded from the web site. Entries can be emailed to entries@honeyshow.co.uk, please pay by BACS, see entry form. Entries for all classes (except 95-102 inclusive, i.e. essays, videos, microscopy slides and photographs-see below) must reach the Entries Secretary, Jill Tinsey; 1 Old School Cottages, Ettling Green, Dereham, Norfolk, NR20 3EU. by the 8th October 2018. Late entries may be made until 15th October, but will incur an additional late entry fee of £10.00. Entry forms for classes 95-102 inclusive, i.e. essays, videos, microscope slides and photographs) must reach the Entries Secretary by 10th September 2018, as these entries need to be with the appropriate convenor by 24th September. No late entries permitted for these classes. 2. Entry Fees: Class entry fee is £1 per class unless otherwise stated. Exemptions from fees are allowed to members of the National Honey Show, entrants in classes 1-8, 32, Junior classes and all gift class entries. The fee for all County classes is £1 each entry. (a) Videos, CDs, DVDs, microscope slides, photographs and essays. Exhibits for these classes ie 95-102 will be required for judging prior to the Show. These must be received by the convenor in accordance with instructions as received from the Entries Secretary. (b) All other exhibits. Exhibitors delivering exhibits personally must unpack them and submit them for staging between 1.00pm and 6.00pm on Wednesday 24th October 2018. Exhibits except classes 1, 16-18, 54, 80-81 86-90, 145-146 may be delivered on Thursday 25th October between 8.00am and 9.00am provided you have indicated on the entry form your intention to do so. Cardboard containers must not be left on the premises as they are contrary to the fire regulations. Exhibits may be sent by courier/post to The National Honey Show c/o Lucinda Riggs, Honey Show, Sandown Park Racecourse, Portsmouth Rd, Esher, Surrey, KT10 9AJ. Not to arrive BEFORE Monday 22nd October 2018. (c) Staging of exhibits will be by the appointed stewards, except Classes 16-18, 52-54, 80-81, 86-90, 145-146, which may be staged by the exhibitor, on Wednesday, 24th October by arrangement with the Show Supervisors. All staging on Wednesday 24th October to be completed by 6.30 pm and the premises vacated. (d) Collection on the Saturday at the close of the Show. The Show closes at 4.30pm. At the close of the show everyone will be asked to vacate the hall. Those collecting exhibits should queue outside the hall, having already brought or collected their boxes and entry forms (these will be available for collection after 2pm on Saturday 27th October). Accompanied by a steward, you will proceed to collect your exhibits from the staging. Make sure you check both the class and exhibit numbers on each entry and that they correspond with those on the entry form. When all have been collected and ticked off on the entry form by the steward, you will be asked to sign the form; the steward will countersign it, indicating that you have received all your entries. Gift entries are not returned unless the exhibit has been bought back at the time of entry, they will not be on the staging, but the steward will take you to reclaim them. When you have collected and signed for your exhibits please leave the hall as quickly as possible. 4. Labels: Exhibitors must label every jar, section, or other exhibit with the labels as supplied by the Entries Secretary before delivery to the show. A minimum charge of £1 will be made for any duplicate labels. No labels will be available on Thursday morning. The labels, which must not be altered, shall be affixed on jars and bottles to allow between 10 and 15 mm between the edge of the label and the bottom of the vessel, or as near to this as possible. On square sections and shallow frames place labels at the right top corner of the vertical transparent face of the case and the duplicate on the top of the horizontal bar of the frame or section. On round sections place one label on rings and duplicate on face 12 – 15 mm from bottom edge of each section. Labels for Cut Comb shall be affixed one on the lid and the duplicate on the long side of the container. If using the new comb containers where the lid is affixed to the case a single label on the lid is acceptable. If a show case is used for wax, one label must be affixed on the glass and the duplicate on the surface of the wax to be shown uppermost. Small blocks of wax shall have a label affixed to each item. On candles the label is to be affixed near the base. For Display Classes only one label will be provided which shall be affixed to the base or table. Except where otherwise specified no Exhibitor’s card, trade mark, label, name or writing may be placed on or attached to any part of an exhibit. 5. Cakes, Small Honey Cakes, Biscuits and Cookies: shall be displayed on a cake board in a clear plastic bag supplied by the show at the time of staging. One label to be affixed to the board and the other to the bag. Except where otherwise stated. 7. Uniformity: When a Class requires the staging of more than one exhibit of the same type, the containers (when used) and the exhibits shall be matching in all respects. Mould marks are not relevant. a) Square sections approximately 454g (1lb) may be enclosed in cardboard commercial sale section cases or white show cases. Round sections must have clear covers on both sides. b) Cut comb honey must be shown in standard UK containers with transparent lids and must have a gross weight between 200g and 255g (7-9oz). c) Frames for extraction should be wired and must be shown in plain protective cases and the comb must be visible from both sides. d) Plastic foundation is not permitted in any class. 9. Extracted Honey: must be exhibited in plain, clear 454g (1lb) squat jars (glass or plastic) with standard gold lacquered metal, or gold plastic, screw tops or twist-offs and matching, except where otherwise stated. See Guidance for Exhibitors. 10. Wax: may be exhibited polished or unpolished at the discretion of the Exhibitor. If a show case is used it must not exceed 300mm square (12 inch). If a show case is not used a board and plastic bag will be provided. 11. Honey Colour: The new BD Standard Grading Glasses will be used. (Grading glasses should be viewed against the side of a standard 454g (1lb) honey jar with a matt white background. Do not use grading glasses against a direct light source). 12. Mead Classes: shall be exhibited in clear colourless or slightly green-tinted round shouldered Bordeaux style wine bottles of 70/75cl capacity, bottles must be PUNTED with no lettering or ornamentation. Bottles with shallow punts are acceptable. Only cork stoppers with white plastic flanges are to be used. No alcohol may be added. No flavouring to be added to Mead, but additions such as acids, nutrients and tannin are permitted. For Classes 62-65, 231 and 251 the Entries Secretary will provide a plain white label to specify whether the content is sweet or dry. The label should be placed 25mm above the NHS entry label. Note for Cyser, sweet entries will be marked down vs dry entries. 13. Awards: Exhibitors may make more than one entry in a Class, up to a maximum of six, but no single exhibit may be shown in more than one Class and an Exhibitor shall not be entitled to more than one award in any one Class. An exhibitor may make an individual and a joint entry in the same class but these will be deemed to be duplicate entries. Multiple owners, when exhibiting, will be considered as one person. 14. Caution: No exhibit or any part thereof may be removed until after the close of the Show, except as provided in Rule 20. No exhibit may be tasted or in any way interfered with the Exhibitor or any person during the Show without the authority of the Appeals Panel. 15. Losses and Damage; The National Honey Show takes every effort to secure exhibits at all times, but cannot be held responsible for uncollected exhibits nor for any losses or damage. 16. Adulteration; If any exhibit is found to be adulterated, the penalty shall be disqualification. Exhibitors will be notified by email where possible on the day of judging. 17. Disqualification: The Committee reserves the right to refuse any entry or exhibit. Exhibitors will be notified by email where possible on the day of judging. 18. Objections: Any protest by an Exhibitor must be made in writing to the General Secretary by 3pm on the Friday of the Show for consideration by an Appeals Panel, consisting of the Judges’ Referee and two other Judges who are not otherwise involved with the objection. The objection must be accompanied by a deposit of £20. Should the protest be sustained by the Appeals Panel or be considered reasonable, the deposit will be returned. a. Increase the number and value of prizes and/or awards in any Class should the number and high standard warrant their so doing. b. Withhold prizes in cases of insufficient merit or entries. c. Submit any exhibit for analysis. d. Sell, or otherwise dispose of, any honey damaged in transit (or reduced in value by any other means) or return the same to the Exhibitor. e. Retain all or any part of any exhibit concerning which a protest has been made until a decision upon such protest has been taken. f. Decide any question as to the interpretation of the foregoing rules and regulations. g. The decisions of the Executive Committee and Appeals Panel on any matter whatsoever, under or in relation to the foregoing rules and regulations, or on any protest or objection in relation thereto or to any exhibit, shall be final and conclusive. 20. All Gift Class Exhibits shall become the property of the National Honey Show Ltd. and will be sold for the benefit of show funds. If you wish to buy back your own entries, then you MUST signify this on the entry form. There is no entry fee for gift classes. 21. Challenge Cups and Trophies won last year should be cleaned and delivered by hand to the organisers of the Show on the Wednesday of the show week. 22. Declaration Exhibitors must complete the declaration on the reverse of the entry form and pay all relevant fees for their entries to be valid. 23. Business Cards A small supply of business cards may be supplied in a sealed envelope supplied by the entries secretary for exhibits in classes 87-89, these will be placed by the exhibit after judging has taken place. a. The word HONEY which may be prefixed with the type of honey and/or area of origin. e.g. New Forest Heather Honey. b. The metric weight must appear – figures to be at least 4mm high for jars exceeding 200g to 1kg weights. If the imperial weight is shown it must be in close proximity to the metric and be less prominent. The ‘e’ symbol if used will be ignored. c. Your name and residential address must appear on the label. d. The country of origin must be shown on the label. e.g. ‘Produce of England’ The country name alone at the end of your address is not sufficient. e. A ‘best before’ date must appear (suggest 2-5 years) or an indication of where it can be found. e.g.. for ‘best before’ see base of jar. If the date is given in full i.e. day, month and year there is no need for a lot number. For full labelling regulations, please refer to the Honey Regulations 2015. 25. No mains electricity will be available for any exhibit. 26. ▲Honey vinegar shall be delivered in bottles of minimum 250ml capacity. The vinegar will be decanted by the stewards into clean standard bottles provided by the Show. 27. 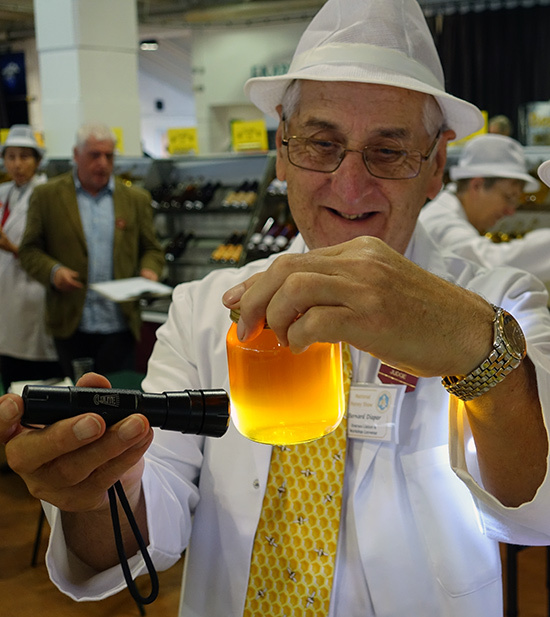 The National Honey Show cannot prevent the photographing of exhibits. 28. ▲For classes 85-103 Exhibits previously entered at the Show, whether prize winners or not, may not be entered in the same class.